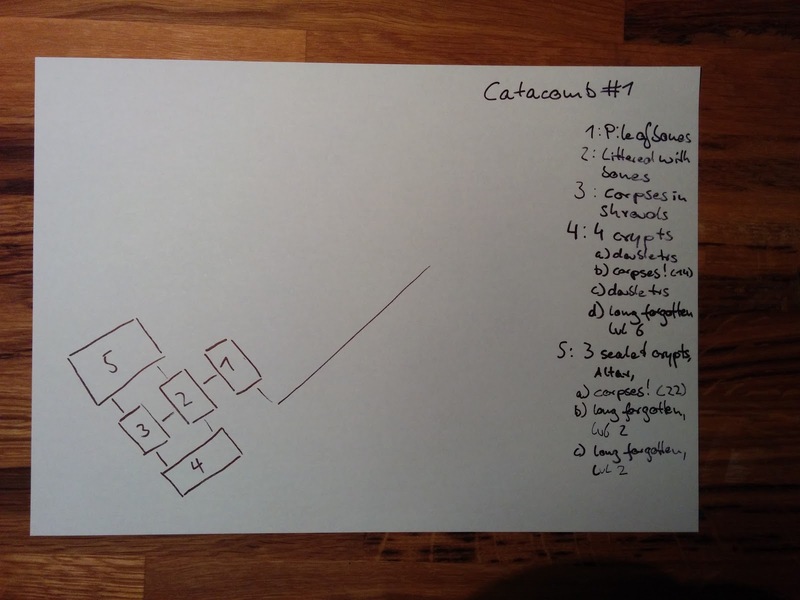 I got two catacombs; one smaller one with but two levels and very little rooms (the photos illustrating this blog post are from the smaller catacomb). Catacombs with few levels usually are not totally overrun with high level undead, but there's enough variance for surprising exceptions. 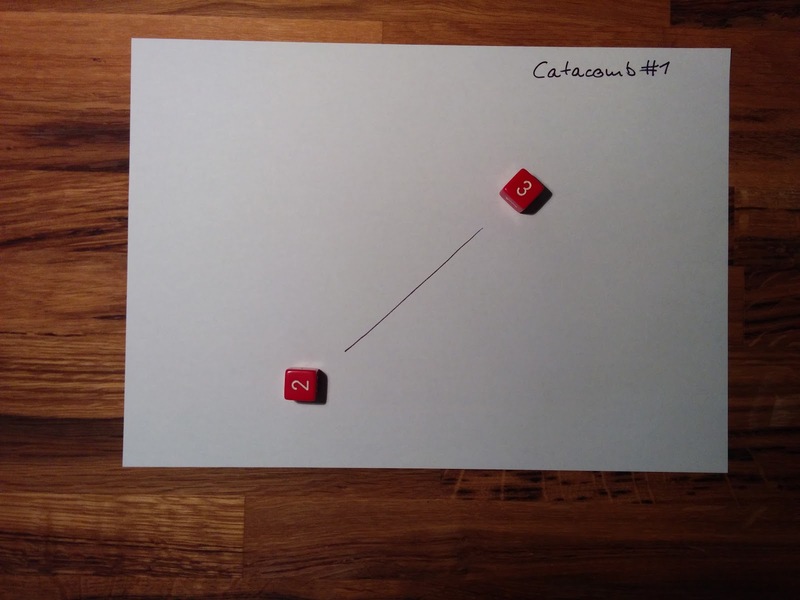 The basics of building these maps are the same as with the Hypogea maps: You roll a number of dice, and connect them; only the number of dice amounts to a die roll, and the connections are predetermined by the dice you roll on the sheet of paper. The procedure is similar enough, but different enough to show it's relationship to other Chthonotron tables, but has it's own personality for lack of a better word. Within the catacomb generation rules are also rules for the referee to use to see whether the dead are disturbed in their slumber, and as with previous tables there are back references to other tables ostensibly written for other purposes, and again self-similarity is gained through interconnected random tables. OK, creating random maps is easy, and the procedure could easily be automated (but I'm too lazy to do so, and going through the procedure manually also has some appeal, as it allows you to think about the outcome while you generate it). 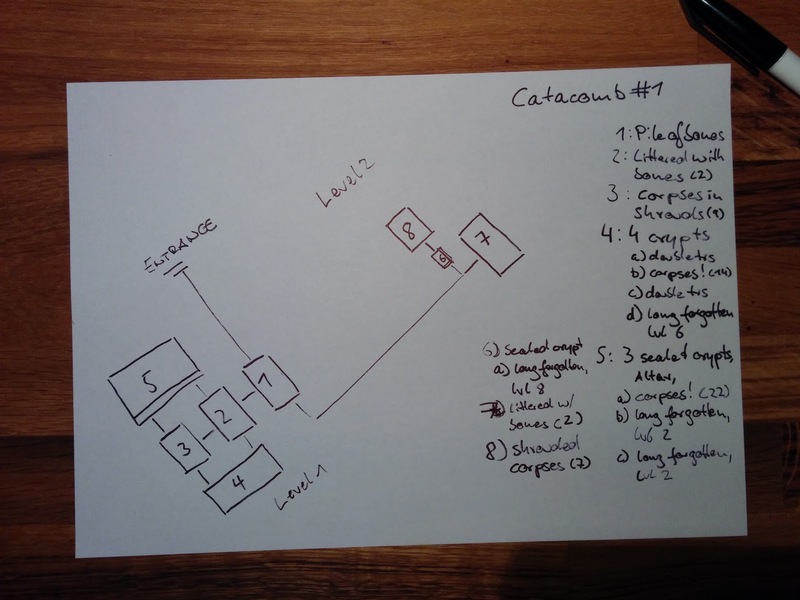 The remaining task is — just as with the Hypogean Maps — how to make sense of the generated catacombs and make them fit into the larger picture. If you roll a large number of unimportant piles of corpses is this a mass grave left behind by cephalopod incursions, or if we have room after room with sealed crypts, maybe the contents was meant to be locked away? For the players, there is only one way to find out, through play; they pay for that luxury with the risk of losing their characters to a randomly appearing high level undead though. Here's some observation about the various results the Sepulchritron (not named this way in CC, but it could well have): Only one result implies that the (un)dead are at this place by accident, or at least not as expected; this could be either previous groups of grave robbers succumbing to the guardians of the graves, or slain/turned undead that went back to rest after the incursionists fled or were driven off; sometimes a mixture of either! The dug shelves of course remind one of the Catacombs of Paris, and my inner Rafael Chandler makes these child/baby skeletons for no other reason as to freak people out. Either way, there's another way that people are buried: They're put under a shroud or winding-sheet. Checking the Chthonic Codex for shrouded monsters did not reveal anything fancy, but it did bring up Karbouna IV and her heresies which started the Fire Dervish Troubles ... I disgress ... Anyways, we have "orderly piles" of many corpses as well, which in my mind intimates some thing or some people having a hand here. I wouldn't be surprised by nearby Skullsnatchers and/or Necromancers raiding the place for parts. And then, of course, there are the crypts. Some of them are sealed with stone slabs, and some of them obviously guard something important, at which point this seems like you could as well drop in Death Frost Doom for any catacomb result and figure out where the snow comes from (both the Observatory and Lake results in the Chthonotron hint at grander openings, which could explain how the snow fits the Valley of Fire above the Hypogea. Or make it exiguent mana tar residue). Either way, it's a good adventure, it fits the Hypogea well, so check it out if this random generation thing isn't to your taste. Now, back to the crypts. 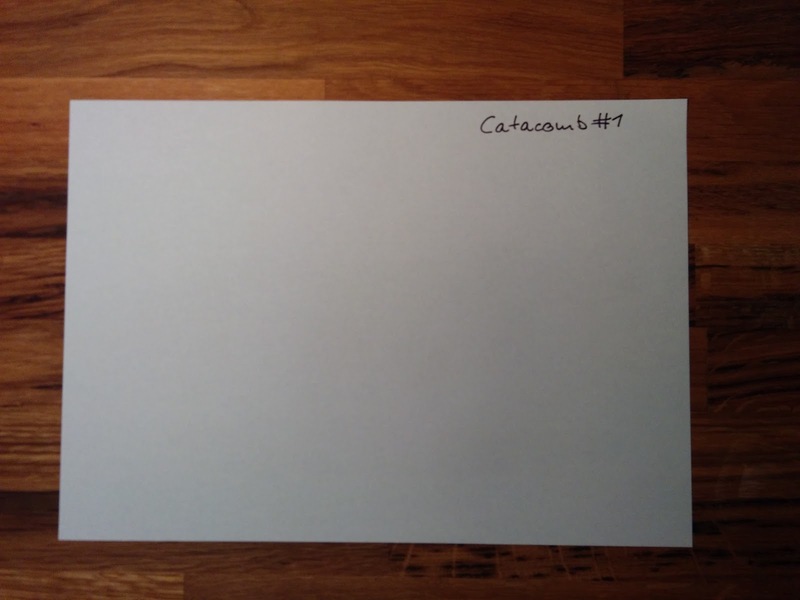 Chthonic Codex refers to the Savant Emeritus, old high level Masters which are sometimes put away by their schools if they don't recluse themselves, so with enough clusters in a Catacomb, you will find those there. A risky, but potentially worthwhile undertaking to find one. The small Catacomb covered in the pictures above, with these things in mind, is easily put in context: Room #1 sports a neat pile of bones, hinting at some easily accessible collection of parts as I outlined above. Room #2 is littered with bones, so things aren't as orderly anymore. Maybe parts were pulled, maybe someone decided to make a stand here, or a recent incursion deeper into the catacombs failed. Room #3 is a nice and orderly grave with corpses in shrouds. These are some random dead people, who so far have not been called to duty. Room #4 is the first series of crypts (I made it available both from room 2 and 3 during an attempt of artistic freedom). 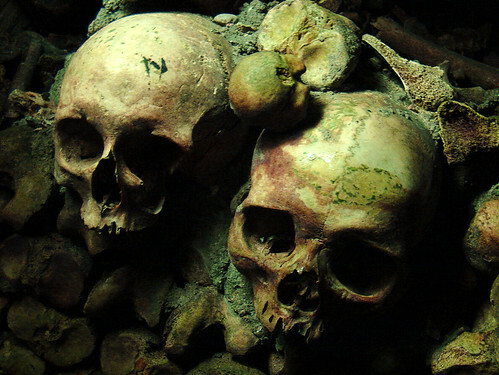 One of the crypts is filled with a bunch of corpses, as we know from crypt searching in old computer text games. It's always funny when the room is suddenly swarmed by a huge bunch of opponents. But there are also some more important people here, and since they are sealed away in crypts, they also have a bit more treasure. So while it's more risky to open crypts, it's usually also worth it (if you survive). Room #5 is a bunch of sealed crypts, as denoted by the double line where it connects to the other rooms. It also has an Altar, which tells us that this is a dangerous place, but with the correctly supplied sacrifice, any perpetrators may placate the deities protecting it. You shouldn't break open any of the crypts though. Unless you like lots of pain, and lots of treasure. Thus concludes level 1. Level 2 is quite small, with another sealed crypt, one room littered with the bones of 2 corpses (maybe two adventurers were sealed in here when they sprung a trap? I totally forgot to mention the traps ... they're so lovely enumerated in the book), and behind the crypt, another bunch of shrouded people, maybe servants of the level 8 undead resting in the previously mentioned crypt?